As a blockchain-focused venture capital fund, 8 Decimal Capital is focused on assisting in the mass adoption of blockchain technology. We believe that this can be done by investing in the future, not only what’s popular. This is why we are consistently conducting thorough research, due diligence, and speaking to industry leaders. As of recent, our research has been primarily geared towards the security token space. Note: This is merely my opinion and I expect many readers to have differing viewpoints. As the security token market gains popularity among the blockchain community, many people are focused on the exchanges as the gateway to liquidity. However, I believe that the market is too nascent for exchanges to bring any value to the tokens that are being listed on them. With that being said, I still believe that major traditional exchanges, such as the Nasdaq, will develop their own solutions to facilitate the trade of security tokens in 2019. As an investor in the space, I have spoken to dozens of projects launching an exchange for security tokens and I ask them the same question, How will you create liquidity for the tokens listed on your platform?” Oftentimes, they answer this question by mentioning the market makers they will partner with and their plans to attract users to their platform. In my opinion, this method won’t produce the results that these exchanges anticipate. Market makers can create liquidity for those exiting a position, but won’t be able to sell the tokens for a profit if there isn’t a market of buyers. In my opinion, exchanges don’t create liquidity. Exchanges are a way of managing an already liquid market and facilitating the trading of liquid assets. Rather, broker-dealers will be essential in the security token market in 2019 as security tokens will initially be used to only digitize the fundraising process, not create liquidity. Many businesses, both traditional and blockchain, are becoming curious about security tokens and how it can benefit their company. In 2019, people will become more knowledgeable about the security token space. As more tokenization platforms appear globally, the Security Token Offering process will become easier and relatively cheaper. Additionally, institutional players will become comfortable with security tokens as more custodians and other infrastructure players provide solutions for security tokens. This combination will result in businesses taking action and launching their own security token, rather than just curiously exploring the idea. Along with traditional businesses, blockchain projects without revenue are also showing interest in the security token market. Investors should beware of risky security tokens, especially those backed by projects without assets or revenue. Security tokens and regulation don’t eliminate the risks of ICO businesses, they only decrease the risk. Security tokens are supposed to be digital assets (emphasis on the word assets). In my opinion, a business without any assets or revenue should not consider launching a security token, yet. Using a utility token as an investment vehicle doesn’t make any sense to me, but I do believe that startups should be able to crowdfund their companies. With the pending downfall of the utility token investment market, ICO companies will have to find a new way to raise money. In 2019, I’m looking forward to seeing a new class of security tokens that will allow new blockchain businesses to access capital from global investors while also protecting investors from fraudulent and worthless projects. This would have to result from the creation of information platforms, new protocols, and new regulations. As I brainstorm this idea more, I will be able to create a more concrete vision of this new class of security token. One major issue with the current security token market is the lack of advanced financial instruments. At the moment, I have only seen security tokens that represent equity in a business. This has been an easy way to start, but won’t be enough to lead to the mass adoption of security tokens. As the next generation of security token protocols emerges, tokens will be able to handle bonds and other derivatives. Currently, there is a lack of debt protocols in the security token market, but I anticipate many to pop up in 2019. Debt protocols can decrease the systematic risk associated with most security tokens and provide investors with immediate cash flow. Additionally, debt holders have first priority in the case of a failing business. 8 Decimal is currently working with technology partners to release our own debt protocol in 2019 that will be used on our soon-to-be-announced tokenization platform. As a venture capitalist, timing must be considered when making any investment. For the security token market, the timing could have a negative impact on the growth of the market. Globally, capital markets are approaching a peak in the cycle. Recent volatility in the US markets and a 10-year bull market has led many to believe that a downturn will happen in the next 6 months. Considering this, there are two schools of thought. Some believe that the security token market will be inversely correlated to the traditional markets, while others believe that there will be a direct correlation. I believe that there will be a direct correlation. In times of economic downturn, asset values don’t experience much growth due to the lack of capital in the market and a lack of expected short-term economic growth. The security token market doesn’t remediate either of these issues, so shouldn’t it also experience a decrease in asset values? On the other hand, investors typically flee to fixed income during an economic downturn because of the constant coupon payments. This is why I stress the importance of security tokens that represent debt. Debt tokens will be able to attract institutional investors, even during a time of economic downturn. As we’ve seen in 2018, some small countries, such as Malta, Gibraltar, and Singapore, around the world will continue creating security token friendly legislation in 2019. Due to the size of their governments, these countries are able to adapt at a quicker pace than larger countries, allowing them to act as nimbly as a startup. Larger countries, with more decision-makers and gate-keepers, will take more time to create regulations specifically for security tokens. Unlike ICOs, regulators around the world are showing positive sentiment towards the STO market, even the SEC. I believe that global regulation will come quickly after the SEC creates regulations which are specific for digital assets. In order for large institutional players to enter the secondary security token market, investors must be provided with reliable and trustworthy information. I believe that platforms, similar to the Bloomberg Terminal, will appear in 2019. However, these platforms won’t use traditional methods to analyze businesses. A combination of blockchain and other advanced technologies, such as artificial intelligence, will be used to increase the efficiency and reliability of reporting information about and rating the underlying assets. Since we started looking at the security token market, 8 Decimal has been on the search for an information platform that could service the market in this capacity. Working in the blockchain industry requires you to be a jack-of-all-trades which is why the blockchain industry is full of diverse talent from a wide range of ages, industries, and regions. Even though this is what makes the industry so great, it is also something holding the industry back. The top tech talent is still working at large companies in the traditional tech space. The top finance talent is still working at traditional banks and financial institutions. That leaves the security token space with a smaller pool of top talent. I believe the current talent in the security token space is highly skilled and intelligent, but the experts of the tech and finance industries could help shape a stronger industry. As the security token market gains more traction in 2019, experts from traditional industries will enter the security token industry for new opportunities. All in all, 8 Decimal is excited to see how the security token market develops in 2019. In addition to investing in security token projects, we intend to participate in the market too. 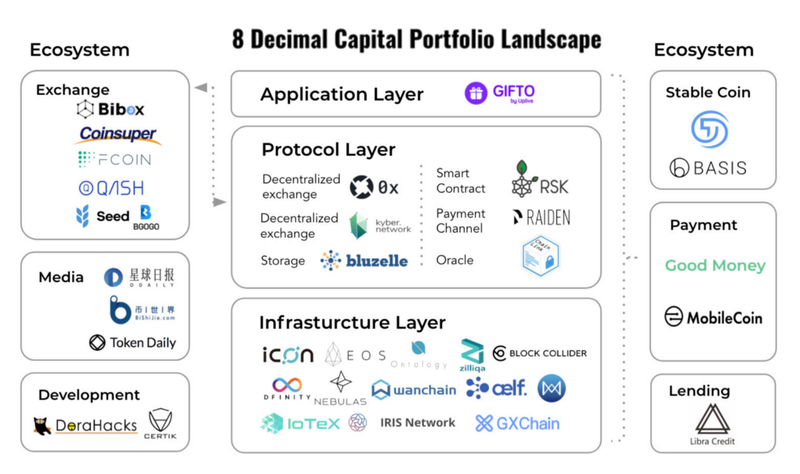 8 Decimal, along with our technology partners, is developing an end-to-end platform to facilitate the tokenization of real assets (including equity, debt, and real estate). While this platform is being developed, we are advising a multitude of traditional and blockchain businesses that want to go through the process of launching their own security token. If you or your business has questions about launching a security token, reach out to me via LinkedIn or email me at: kadeem@8dcapital.com. 2019’s Security Token Market Trends was originally published in Hacker Noon on Medium, where people are continuing the conversation by highlighting and responding to this story.